I’ve talked about day jobs before, and how they can be useful for a number of reasons (steady income, giving your brain time to think through plot points and whatnot, etc.). I’ve also talked about how I think, at least for me, being a full-time freelance writer/editor has hurt my fiction (or at least my motivation). So I’ve been thinking very seriously about finding a new day job. The problem is that the options are wide open. (I think I talked about that somewhere too.) I do think I’ve decided to go for something non-freelance, something where I have to go some place and talk to other people on a semi-regular basis. They recommended a series of assessments to help me learn about what’s important to me and what jobs would be a good fit. And I figured, hey, what could it hurt? That was a few months ago, and now I’m done with the lot. There was the Clifton Strengths, which told me what my strengths were. Then Myers-Briggs for personality. The Strong for what I’m interested in. And the Values for what’s important to me in a job/work place. Then the idea is to look at all four, see what patterns there are, and make a decision moving forward based on the results. None of the results are especially a surprise, but I bet you that I wouldn’t have been able to pull the information out of my head before hand. The strengths was probably the most useful, in that they give you your top five strengths and explain how they are both good and bad (for example, one of mine is that I absorb information easily, which means I can learn–and apply–new things quickly. But the downside is that I can get distracted by research and lose a lot of time). But it is nice to have it all laid out. Not sure it’s useful yet, because I can see three distinct career paths that could be taken from the results. But aside from potential day jobs, I can also see how some of the information can be useful in my writing. It’s given me some ideas on how to work, and also on some new projects to try. So if you have the opportunity, it might be a good idea to run through these tests yourself. One of the best ways to be true to yourself is to have a good idea of how you work. These tests aren’t perfect, of course, but especially by taking the lot, you can get a good general idea of things. Taken assessments, squiders? Find them to be of any use? You get the point. But we don’t just remake it in the same form. We make a movie form and a book form and a television form and a video game form, and then we twist it and tell the same story again, with new twists or new settings or with some characters now a different gender or whatever fits our fancy. I recently noticed that the Japanese do this too–though they do it differently. The stories never seem to make it to the twisting phase. Let’s take one of my favorite anime series, Ouran High School Host Club, which is utterly ridiculous at almost all times, yet still manages to make you care about all the characters. Ouran High School Host Club (here on out shortened to Ouran) started as a manga (for those unfamiliar with the term, manga is kind of like a comic book, so pictures and words in a sequential order) and the beginning of the manga was made into an anime (essentially a cartoon). Many anime are made from manga series, and, for the most part, anime series tend to follow their manga counterparts pretty closely. Some years after the anime came out, they made a live action series of Ouran. Like it sounds, live action series have real people in real locations. What’s interesting is that the story doesn’t really change between mediums–when watching the live action, I recognized almost all the episodes from the anime–and when additions are made (such as a filler arc or a movie) they’re always made to fit into the world and story lines that already exist. If an anime gets too far from the manga, they remake the anime to fit the manga better. But, as far as I know–and please feel free to correct me if I am wrong–they never twist. From Peter Pan they wouldn’t get Hook, or Jake and the Neverland Pirates, or Peter and the Starcatcher. No Wizard of Oz except they’re all insane, or everyone’s a grown up and steampunk, or told from the witch’s point of view. You have Bleach, and Bleach goes on for 696 manga chapters, 366 anime episodes, four movies, a live action film (which JUST came out), five musicals, two trading card games, several light novels (essentially a novel with occasional manga-style pictures), and at least five video games. Or One Piece, which has been going since 1997 and has over 800 anime episodes. A story can go on forever, being retold from one medium to the next, and then, when they’re done…they’re done. On to the next thing. Or the same thing in a different form. I just think it’s interesting, to look at how a story can mean so much that we’re willing to watch it–or read it, or play it–over and over. And to see how different cultures go about doing just that. Am I wrong about Japanese storytelling not twisting the same story into new forms? (I know there are some manga/anime that are twists on Western stories–Pandora Hearts, which I’m reading right now, obviously has its roots in Alice in Wonderland–but I’m unfamiliar with any stories that are twists on other Japanese stories.) Favorite version of a favorite story? Time for a New Readalong! It’s been almost half a year since we read The Sparrow, so let’s pick out a new book and/or series to look at! I’ve tried to provide a wide variety of genres and standalone/series options. Also, if you’d very much like to do a different book or series, please let me know in the comments. Also let me know if you prefer if I just pick a book on my own. The polls are still a new thing. We recently received a free trial of Netflix. I’m not a big television watcher, but in an effort to justify Netflix’s existence on our Roku, I’ve started watching The Great British Baking Show, which I’ve heard good things about. Full disclosure: I am a horrible baker. The other day, I was watching the GBBS with the small, mobile ones, who were actually way more into it than I thought they would be. I mean, it’s essentially a load of people with funny accents (but then, the younger one is rather into Peppa Pig, so perhaps the accents aren’t that weird to them) talking incomprehensibly about pastries and gluten and proofing and a ton of things I don’t understand, but hey. I was tired and they were staying put. Then the bigger one proposed that we make a cake of our own. My first instinct was to squash that idea like a bug, but parenting, much like improv, often involves saying “yes” to things you don’t want to, so I fished out a cookbook that seemed likely to have cake recipes (Better Homes and Gardens, 12th edition) and decided on chocolate sponge cake, since the people on GBBS are always making sponge cake. 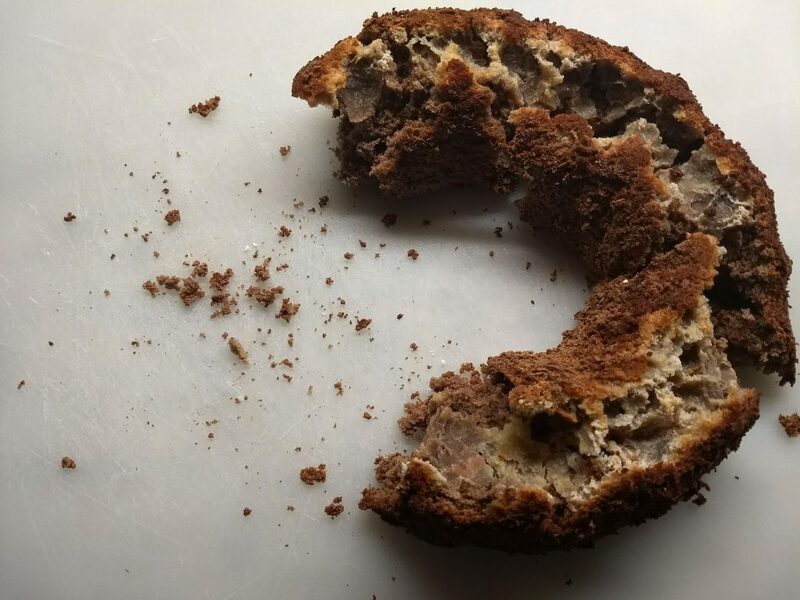 I’ve yet to figure out how to get a cake out of a bundt pan successfully. As you can see, the top stayed with the pan. And we definitely overcooked it. And the bigger mobile one apparently had grand plans to copy the show participants and create an elaborate scene on top with frosting and candy and what have you. It doesn’t taste terrible. But as far as cakes go, it’s pretty sad. Are you a decent baker, squider? What’s your favorite recipe? The small, mobile ones have expressed interest in trying again once we’ve bought more sugar.